The idea of a good life for Irene Siderakis was being able to stay at home with her four children. She got to live that dream until her husband, Christos, died suddenly in April, leaving her to run the 24-hour Williamsburg diner they owned together. Life has a way of throwing things at you, she told me one November afternoon, standing behind the counter. Clad in black, she wore no adornments, save a pair of pearl earrings, and teared up as she recounted Chris’ burial at the Antonopoulos funeral home in Astoria, where the line of mourners snaked around the block. Irene had no time to grieve. Someone needed to take the reins at Kellogg’s, one of the oldest and busiest diners in Brooklyn. Death! Destruction! Dutchmen! The history of one intersection in the East Village features murders, kidnappings, and a few famous names. Now the Spotted Owl Tavern occupies ground level at the northwest corner of Avenue A and 13th Street, the latest in a long line of bars at that location. There’s been a watering hole in that space (well, a saloon or maybe a bierpalast or a nightclub) for over 125 years, exempting, legally speaking, the unfortunate period between the 18th and 21st amendments. 29 Avenue A, 1939-1941 New York City Department of Records. The bullet tore through John Muller’s chest just above his left clavicle, fracturing the bone into small splinters that lacerated surrounding flesh and vein. The lead ball lodged in his neck between the trachea and the esophagus. His right temple was swollen and abloom in blackened bruises. Police officers had bludgeoned him, witnesses said, just outside his home at 29 Avenue A. But it was the gunshot, the coroner testified, that killed John Muller on July 11, 1857. Muller died in the basement of what is now 33 Avenue A between Second and Third Streets. Today, the plot houses Joyful Nail Salon flush with clients reclined on taupe leatherette pedicure chairs. A sign outside advertises color gel and manicures. Just above, public housig apartments have long since replaced the original 19th century tenement building. But to peel past that lacquered exterior is to reveal the plot’s history long since erased. A history of the East Village when it was German-speaking Kleindeutschland with tenement houses lining Avenue A; of a city in turmoil in the summer of 1857; of a riot in the 17th ward; of a clash between police and a largely immigrant community; of a man shot dead. From Fire and Water Engineering, 1907. The Essex is the tall, glassy residential and commercial building that looms over Broome Street between Essex and Norfolk. It is more a promise of the neighborhood’s future than a relic of its past, all visual traces of which disappeared when the block was razed in 1967. 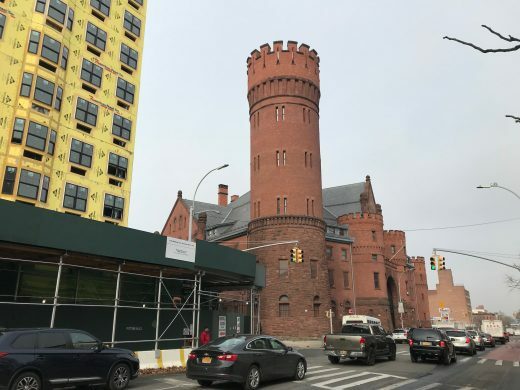 The new 26-story building fills in the blank of what in recent years was a vast and vacant parking lot that gave no indication of a block was once dominated by New Irving Hall, an active site of civic life in the Lower East Side. On July 24, 1899, thousands of newsboys gathered at New Irving Hall at 214 – 220 Broome Street, only days into what became a two-week strike against New York’s rival afternoon newspapers, the New York Evening World published by Joseph Pulitzer and the New York Evening Journal published by William Randolph Hearst. A view of the Greenpoint Hospital complex from across Jackson Street, on the corner with Kingsland Ave. On the right are buildings owned by the Neighborhood Women Legacy Project, one of the original founders of GREC. 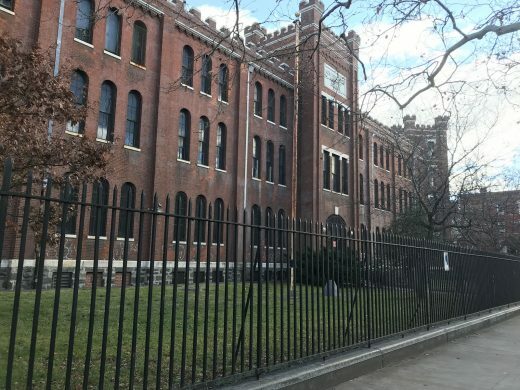 This past September, New York City’s housing department announced plans to convert the entirety of the long-abandoned Greenpoint Hospital complex into over 500 units of affordable housing and 200 units of housing for the homeless. 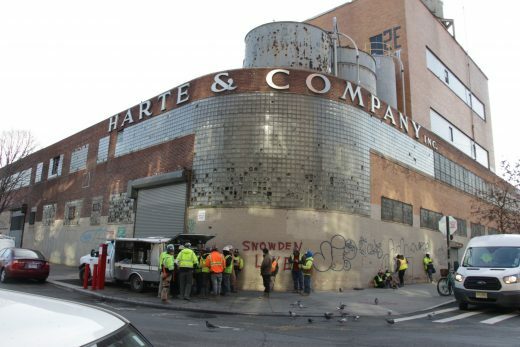 The new project grows out of a nearly three-decade battle between the city and a number of Greenpoint neighborhood community organizations. But a deeper look at the history of this plot of land reveals that the complex’s commitment to working class, underserved families reaches further back. The recent announcement to transform this historic and often contentious space into a community-supported and designed project represents a victorious new chapter in a longstanding legacy. Exterior of the armory today. Allen Ross lives in a castle, but it feels more like purgatory. Ross is diabetic, arthritic and schizophrenic and had to turn to the Bedford Atlantic Armory Men’s Assessment Shelter when he could no longer pay his rent. He’s spending his day passing time in the shadows of the turrets that tower four stories into the air above Crown Heights. Like the rest of the residents of the 124-year-old edifice that has been a shelter since 1983, Ross is in the assessment phase of the New York City shelter system, meaning he is waiting to be placed in long-term housing. The typical stay at Bed-Atlantic lasts 21 days. Rev. 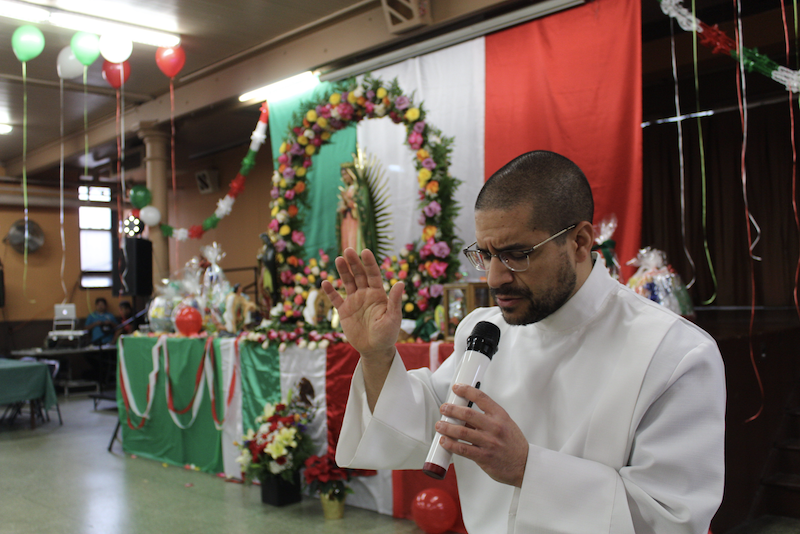 Rafael Perez leads a prayer at the St. Nicholas Roman Catholic Church on Dec. 9, 2018. 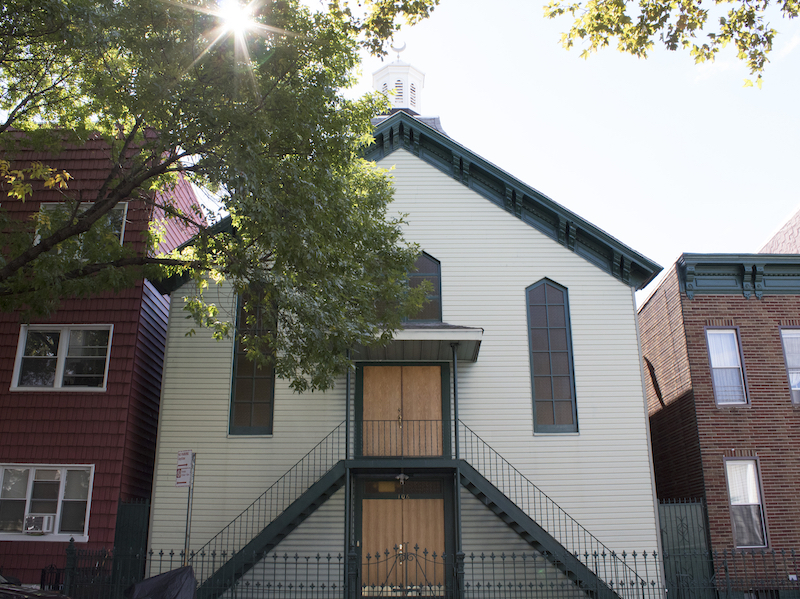 On a recent Sunday, right after Spanish-language services, an eight-piece mariachi band streamed into the St. Nicholas Catholic Church in East Williamsburg. Guitars and trumpets blended together in a musical homage to the Virgin of Guadalupe, a venerated figure who symbolizes devotion throughout the Latino community. Just below in the main hall, a feast was on the tables and flowers, flags and banners surrounded the virgin’s likeness. St. Barbara Greek Orthodox Church, present day. 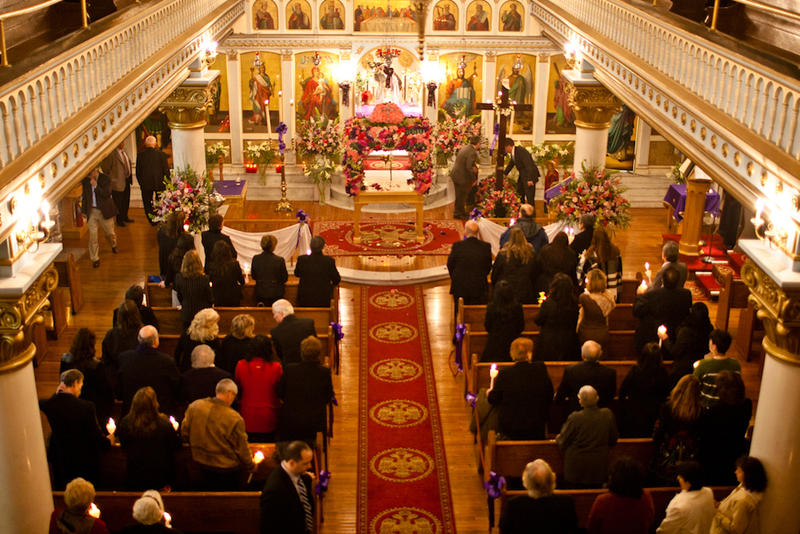 Greek Orthodox worshippers gathered on Dec. 3 to hear Archbishop Demetrios of America speak for the Feast Day of Saint Barbara at the eponymous St. Barbara Greek Orthodox church. The church was named for a martyr whose faith was seen to be unparalleled. Saint Barbara is said to have been tortured through the night for her Christian beliefs, and to honor this the visitors and parishioners at Saint Barbara Greek Orthodox church chanted in unison until the candles lit by the idols at the doors of the sanctuary had all burnt out and the sun cast its first wan fingers of light against the window panes. The building on the corner of East Seventh Street and Avenue A is painted vibrant yellow and blue. Inside of Miss Lily’s 7A, the theme continues with patterns and colors that reflect a diverse crowd that keeps the place buzzing past midnight on weekends.